Correct me if I’m wrong, but it seems that the shorter the season of a certain food, the more magical it appears. It’s true for figs, cherries, summer tomatoes, and most other jewels of the earth, really. It’s certainly the case with fava beans, those brilliantly green peas of the giants. 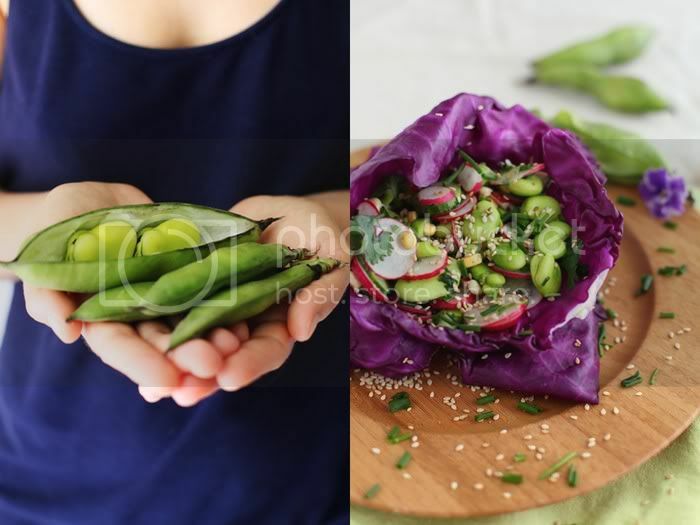 Seeing them in stores here in Florida is such a rare occasion, that when I recently ran across favas, I wanted to come up with a fun and bright salad to properly celebrate them. I’ve heard about the surprising combination of vanilla bean and balsamic before, and finally decided to try it out in the dressing for this timbale. The two make for a very interesting vinaigrette – slightly sweet and incredibly fragrant. If you are a balsamic lover, increase the amount of it in the dressing, as I tried to keep it light. I also thought it would be fun to present the salad in the form of timbale, it definitely makes the eating experience more special. We just got back from San Francisco – talk about falling in love all over again. Plenty of fresh fava beans at the markets there, along with the sweetest of cherries, peaches, apricots, and a myriad of the most otherworldly greens. We’ll have a Travel Notes post up next week. Meanwhile, enjoy the favas. I used raw fava beans in this recipe, but you can also blanch the shelled beans in boiling water for a minute before peeling them. Corn can also be boiled, as opposed to raw, for 4 minutes and then rinsed under cold water before cutting kernels off the corn ear. Chop fava beans into 2-3 pieces each. Mix them with corn kernels, tarragon, and a generous pinch of coarse sea salt, leave to soften. Place the cucumbers in a colander, sprinkle with salt and leave to release juices. Mix cabbage with a pinch of salt and a squeeze of lime juice, massage for a couple minutes with your hands and set aside. Whisk all the ingredients together in a small bowl. 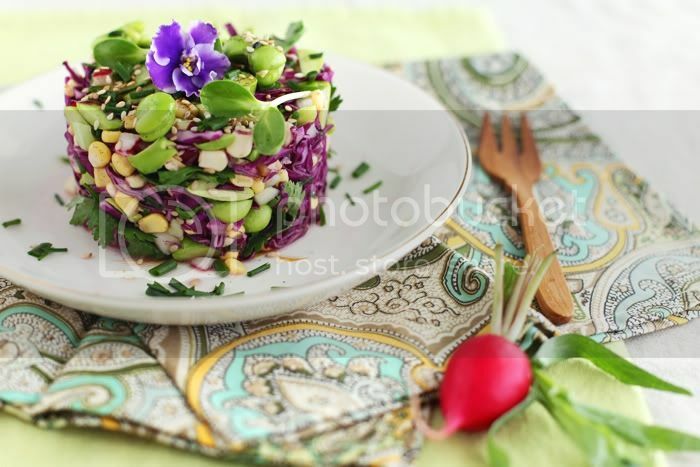 In a bowl, combine all the vegetables with the cubed radishes and the rest of the timbale ingredients. Pour in about one third of the vinaigrette, mix to incorporate. If making a timbale, place the ring mold of the size you like (I used 2 1/4-inch in height and 3 3/4 in diameter) on a plate and pack the salad inside the mold. Place a jar filled with liquid on top and let it stand for 10-15 minutes. Carefully remove the mold and repeat the process to make more timbale. Drizzle with remaining dressing, garnish with chives and sesame seeds. Serve with microgreens or any fresh salad greens. Optionally, you can also serve timbale as a salad, without molding it. In this case, simply slice the cucumbers and radishes and leave fava beans whole. The rest of the recipe stays the same. 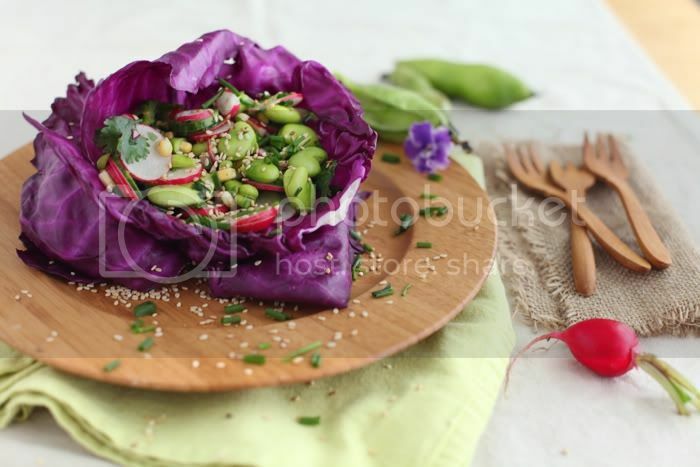 Serve in a purple cabbage leaf for a nice presentation if you like. what a gorgeous salad!! oh my gosh, those colors! wow! 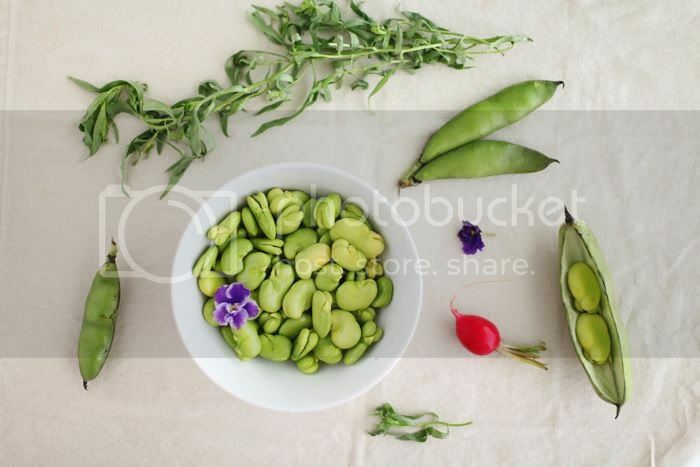 i’ve never had fava beans before — I’ll definitely have to give them a try! and that dressing sounds so interesting — i’m intrigued! Woah… that is so unusual & bold! Awesome. I always felt intimidated by fava beans, but your timbale looks so tempting and the recipe seems easy enough even for me. Beautiful photos! 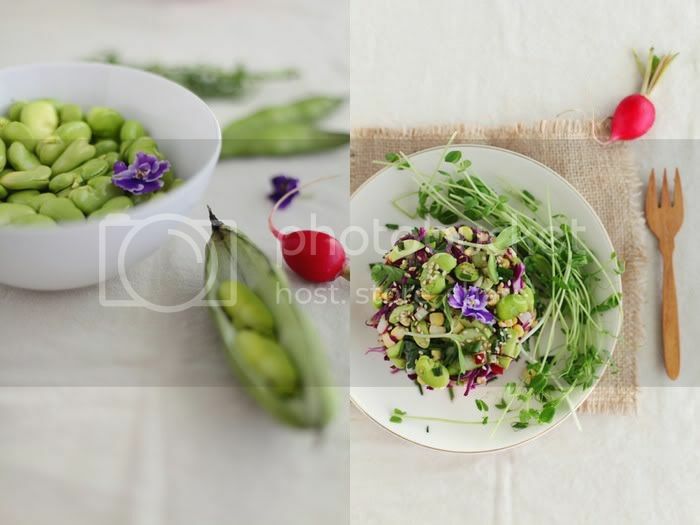 Love the shape of the salad and the vibrant colors. the dressing sounds incredible! What a wonderful pics of fava bean timbale with tarragon and vanilla bean you have here. I love how you played with the combo of ingredients and colours…so wonderful. Stunning! The colors, the flavors- really an inspiring combination. It’s so easy to let short-seasoned fruits and veg pass you by, I try and take a moment to stop and celebrate them with a special dish. I look forward to fava beans all year long! This looks wonderful! Beautiful colors! This salad looks delicious! I love the colors!!! what a great idea to use form for the salad!!! As always inspiring !!! Your pictures are such lovely ! How beautiful! Favas are one of my favorite spring delights, too. And such a clever idea to add vanilla bean to the vinaigrette – adding that to my must-try list. Its my first visit to ur blog n i’m dumbstruck at the beauty & the vibrancy of ur pictures . Just love the way u play with colors & make the simplest of ingredients so magical !! !